A fast, compact laser printer recommended for home office & small business use. 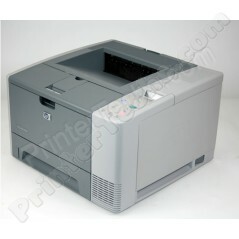 This printer features speeds of 35 pages per minute, and a JetDirect card for connecting to a network. This model includes 32MB RAM, and a 250-sheet paper tray. Print speed is rated at 35 pages per minute, and a JetDirect card is included for connecting to a network.